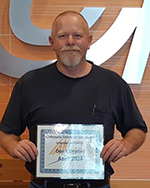 Don Campbell was named the Company Driver of the month for April. Don lives in Cleveland, GA and has been driving for ACT for 11 years. His safety advice is to slow down and leave more space in traffic situations. Don likes the continuous lessons of patience and endurance that driving gives you that can be applied in all areas of life. Don’s DSM is Tammy Warren.